Cassidy Willey, show director, goes through scenes with the cast of The VOICES Project’s latest production. "Void of Darkness, Eat the Light," during rehearsal at the Carbondale Library. Cost: $10 donation suggested. Call 719-480-3024 to reserve seats. For more information, visit www.amplifyingvoices.org. “We feel that when you bring a diverse group of kids together, a diverse group of teaching artists, and you have different art forms available for self-expression, really exciting things happen,” VOICES Executive Artistic Director Renee Prince said. Added teaching artist Ryan Prince, “I think the name of the nonprofit really speaks to the mission, providing everyone voices — giving individuals, young or old, the ability to come together in a group and have a safe place to share each others’ voices and feelings. 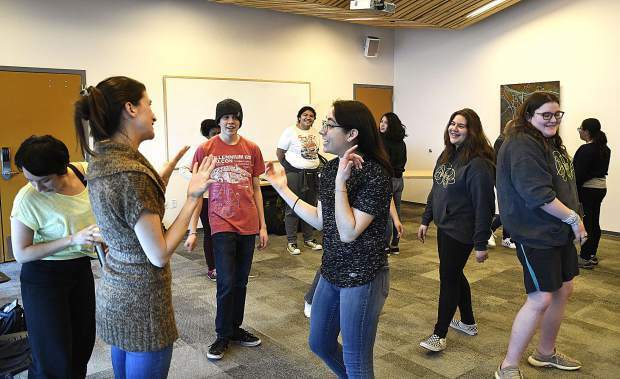 With five weeks from the first meeting to the final curtain, 20 high-schoolers have been writing scenes and poetry, building puppets, choreographing movement, and composing songs in preparation for the project. Renee Prince says it’s a nice counterpoint to all the screen time that is in the world now. Second-year participant Daniela Rivera said she was super nervous her first year, but those nerves have settled a bit this year. “All the stories that we present, we are so vulnerable with ourselves … 99.9 percent of the time the pieces are true, so they are intense, which makes it scary.” Rivera said. Added Renee Prince, “It’s a group of very brave students, who haven’t found an artistic home in other after-school opportunities. The curtain will rise for the cast and crew at 7:30 p.m. Friday at the Third Street Center in Carbondale for the first of three shows.